I have discussed request validation many times when we see the potentially dangerous input error message when viewing a web page. Another interesting protection in ASP.Net is the built-in, on by default, Request.Path validation that occurs. 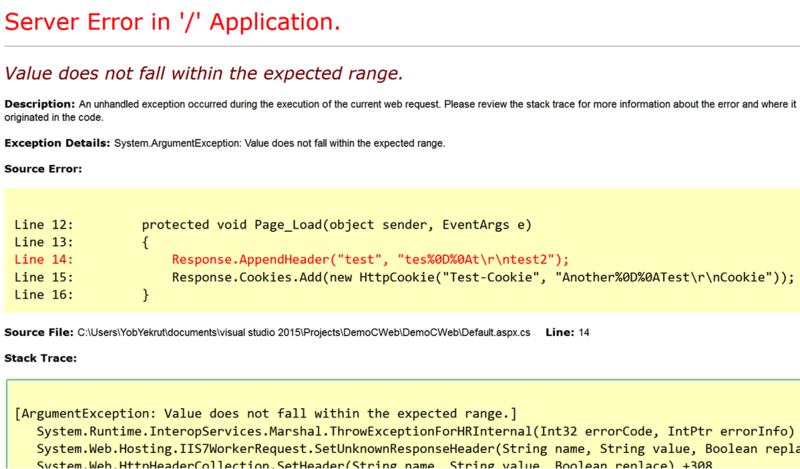 Have you ever seen the error below when using or testing your application? It is important to note that these characters are blocked from being included in the URL, this does not include the protocol specification or the query string. That should be obvious since the query string uses the & character to separate parameters. Be aware that due the the web.config file being an xml file, you need to escape the < and > characters and set them as &lt; and &gt; respectively. Remember that modifying the default security settings can expose your application to a greater security risk. Make sure you understand the risk of making these modifications before you perform them. It should be a rare occurrence to require a change to this default list. Understanding the platform is critical to understanding what is and is not being protected by default. I remember years ago when we talked about cookie poisoning, the act of modifying cookies to get the application to act differently. An example was the classic cookie used to indicate a user’s role in the system. Often times it would contain 1 for Admin or 2 for Manager, etc. Change the cookie value and all of a sudden you were the new admin on the block. You really don’t hear the phrase cookie poisoning anymore, I guess it was too dark. There are still security risks around the cookies that we use in our application. I want to highlight 2 key attributes that help protect the cookies for your .Net application: Secure and httpOnly. The secure flag tells the browser that the cookie should only be sent to the server if the connection is using the HTTPS protocol. Ultimately this is indicating that the cookie must be sent over an encrypted channel, rather than over HTTP which is plain text. There are multiple ways to set these attributes of a cookie. Things get a little confusing when talking about session cookies or the forms authentication cookie, but I will cover that as I go. The easiest way to set these flags for all developer created cookies is through the web.config file. The following snippet shows the httpCookies element in the web.config. As you can see, you can set httponlycookies to true to se the httpOnly flag on all of the cookies. 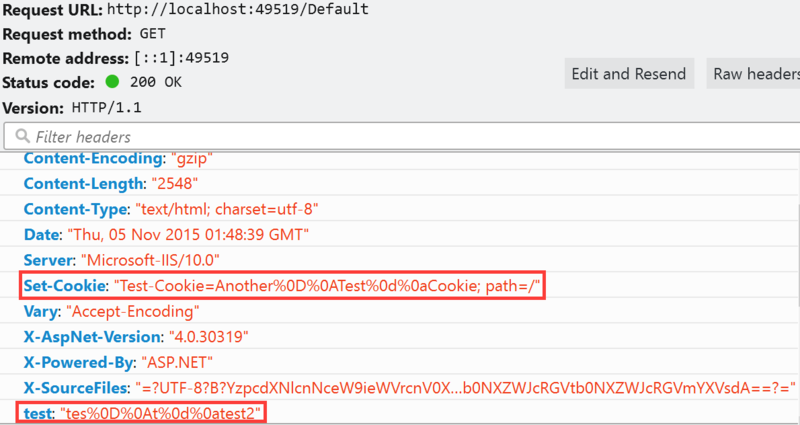 In addition, the requiressl setting sets the secure flag on all of the cookies with a few exceptions. I stated earlier there are a few exceptions to the cookie configuration. The first I will discuss is the session cookie. The session cookie in ASP.Net is defaulted/hard-coded to set the httpOnly attribute. This should override any value set in the httpCookies element in the web.config. The session cookie does not default to requireSSL and setting that value in the httpCookies element as shown above should work just find for it. The forms authentication cookie is another exception to the rules. Like the session cookie, it is hard-coded to httpOnly. The Forms element of the web.config has a requireSSL attribute that will override what is found in the httpCookies element. Simply put, if you don’t set requiressl=”true” in the Forms element then the cookie will not have the secure flag even if requiressl=”true” in the httpCookies element. This is actually a good thing, even though it might not seem so yet. Here is the next thing about that Forms requireSSL setting.. When you set it, it will require that the web server is using a secure connection. Seems like common sense, but… imagine a web farm where the load balancers offload SSL. In this case, while your web app uses HTTPS from client to server, in reality, the HTTPS stops at the load balancer and is then HTTP to the web server. This will throw an exception in your application. I am not sure why Microsoft decided to make the decision to actually check this value, since the secure flag is a direction for the browser not the server. If you are in this situation you can still set the secure flag, you just need to do it a little differently. One option is to use your load balancer to set the flag when it sends any responses. Not all devices may support this so check with your vendor. The other option is to programmatically set the flag right before the response is sent to the user. The basic process is to find the cookie and just sent the .Secure property to “True”. While there are other security concerns around cookies, I see the secure and httpOnly flag commonly misconfigured. While it does not seem like much, these flags go a long way to helping protect your application. ASP.Net has done some tricky configuration of how this works depending on the cookie, so hopefully this helps sort some of it out. If you have questions, please don’t hesitate to contact me. I will be putting together something a little more formal to hopefully clear this up a bit more in the near future. A common security concern found in ASP.Net applications is Insufficient Session Timeout. In this article, the focus is not on the ASP.Net session that is not effectively terminated, but rather the forms authentication cookie that is still valid after logout. User is currently logged into the application. User captures the ASPAuth cookie (name may be different in different applications). Cookie can be captured using a browser plugin or a proxy used for request interception. User saves the captured cookie for later use. User logs out of the application. User requests a page on the application, passing the previously captured authentication cookie. The page is processed and access is granted. The application sets the Cookie.Expires property to a previous DateTime. Following the user process above, the cookie still provides access to the application as if the logout never occurred. So what is the deal? The key is that unlike a true “session” which is maintained on the server, the forms authentication cookie is self contained. It does not have a server side component to stay in sync with. Among other things, the authentication cookie has your username or ID, possibly roles, and an expiration date. When the cookie is received by the server it will be decrypted (please tell me you are using protection = all) and the data extracted. If the cookie’s internal expiration date has not passed, the cookie is accepted and processed as a valid cookie. So what did FormsAuthentation.Signout() do? If you look under the hood of the .Net framework, it has been a few years but I doubt much has changed, you will see that FormsAuthentication.Signout() really just removes the cookie from the browser. There is no code to perform any server function, it merely asks the browser to remove it by clearing the value and back-dating the expires property. While this does work to remove the cookie from the browser, it doesn’t have any effect on a copy of the original cookie you may have captured. The only sure way to really make the cookie inactive (before the internal timeout occurs) would be to change your machine key in the web.config file. This is not a reasonable solution. Set a short timeout (15 minutes) on the cookie to decrease the window an attacker has to obtain the cookie. You could attempt to build a tracking system to manage the authentication cookie on the server to disable it before its time has expired. Maybe something for another post. Understand how the application is used to determine how risky this issue may be. If the application is not used on shared/public systems and the cookie is protected as mentioned above, the attack surface is significantly decreased. 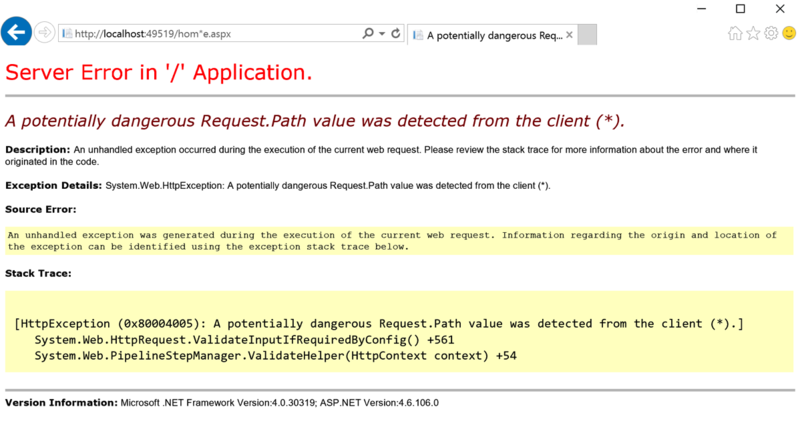 If you are facing this type of finding and it is a forms authentication cookie issue, not the Asp.Net session cookie, take the time to understand the risk. Make sure you understand the settings you have and the priority and sensitivity of the application to properly understand “your” risk level. Don’t rely on third party risk ratings to determine how serious the flaw is. In many situations, this may be a low priority, however in the right app, this could be a high priority.